The Plant in the City is a solo presentation by Catriona Gallagher, marking the preview screenings of her new film Perdikaki | Περδικακι and the launch of a new publication of drawings and writing from the Pellitory Study (2013-2018). 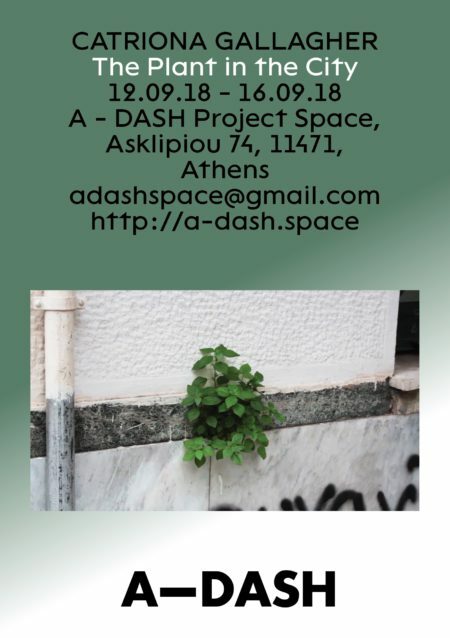 Over five years in Athens, the artist has been investigating a small herbaceous weed -Pellitory of the wall / Parietaria officinalis / Περδικακι- and its growth in the city and further afield. She first noticed the plant growing from a crack between the pavement and a step whilst undertaking a residency in the city in October 2013. On recognising it again growing between marble fragments at the edge of an ancient site, she asked an attendant its name and thus began the investigations into the plant’s prolific urban growth, which saw the artist return to live in Greece and work on the project from mid 2014 onwards. Between drawing, writing, video footage, plant specimens and tools, the Pellitory Study comprises the artist’s findings on the plant during this time. Alongside and from within these research processes emerged a semi-fictional narrative and several characters, which gradually developed into the storyline for the recently completed film. Perdikaki | Περδικακι (2018) is a wandering narrative through the city of Athens following the growth of the prolific weed pellitory and its relationship to the urban environment. The Narrator’s search for elderly woman The Kyria, who was first seen picking the weed, then weaves through the empty and abandoned places of the city, searching for meaning in the overlooked plant. As observations, findings and specimens accumulate, a shadow researcher, The Collector, emerges and the focus blurs: are we in pursuit of the elderly woman’s wisdom, or The Collector’s? And other than the symbolic plant, do the other players exist at all? Film screenings will begin at 21:00 each evening in the yard; seating is limited so attendees are advised to arrive early.